It began when she was in middle school, and would obsess over old National Geographic magazines, particularly those sharing the stories of women belonging to the Kayan Lahwi tribe originating in Thailand and Burma. The images of these women enthralled her. She started simply – by wrapping cut-up coat hangers around her neck. But to examine where she was going, we need to first see where she came from. 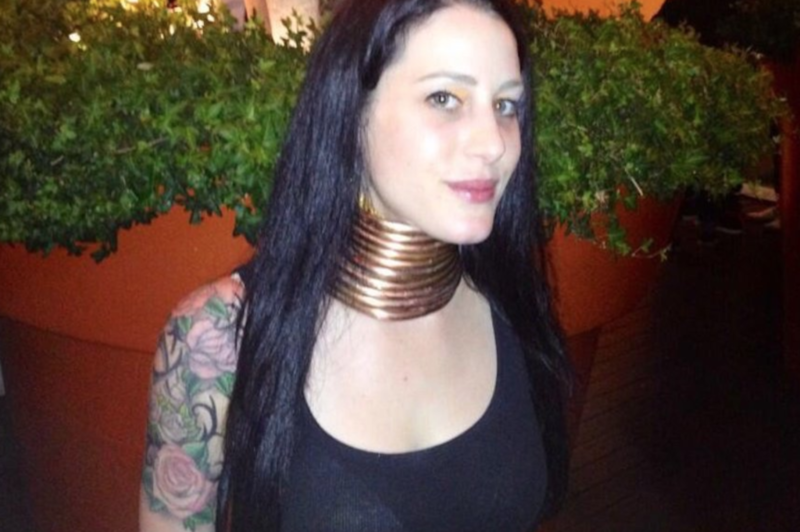 The custom of wearing brass rings around the neck Sydney was so enamored with came from the Kayan Lahwi ethnic group of Burma. The meaning of the centuries’ old custom has been lost to time, and is now a signifier of cultural identity. Regardless, Western anthropologists have suggested several possible origins, concluding the tribe’s women wear the coils to appear less attractive to members of other tribes, making them less likely to be taken hostage. Conversely, others said they were intended to make them more attractive to men from their own tribes. Whatever the reason, Sydney couldn’t look away. As soon as she was old enough, she knew she would act to make her dream come true. Sydney really believed her nighttime neck-stretching made her neck longer. 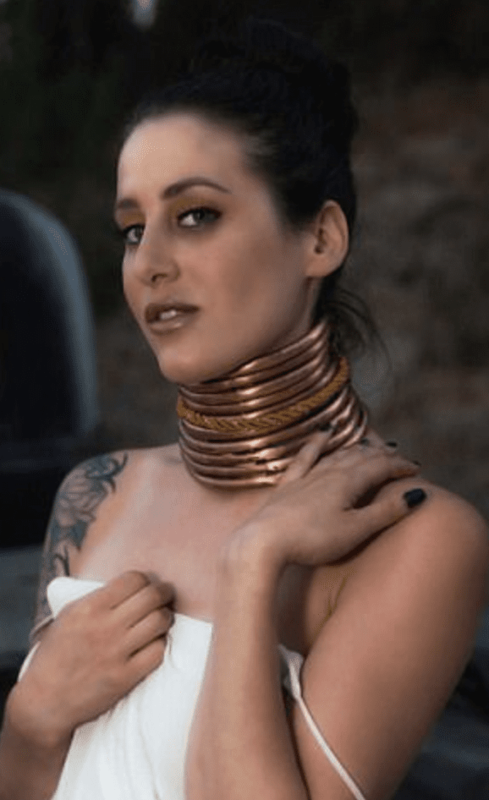 She then stopped for several years, to consider whether “being a long-necked woman was what I really wanted.” She deliberated, and ended up deciding she’d go through with it, having a tight-fitting copper necklace made to encase her neck. Her reasoning for doing so was simple: “I missed the comfort from the pressure on the top of my neck and shoulders.” She didn’t do it for anyone else – it was strictly for the comfort and exhilaration the process gave her. Despite going through the process slowly, and only adding another ring to the necklace when she felt she was ready, Sydney still felt somewhat self-conscious. Living in Maryland at the time, she took to wearing turtleneck sweaters that covered her neck rings. She also worked restaurant jobs that did not necessitate interacting with patrons to avoid any unwanted attention. After some more time passed, she could feel the muscles in her neck growing weaker. She had reached a decision point – either take the rings off before it was too late, or remaining committed. The giraffe woman decided to plunge ahead with the change after receiving inspiration from none other than Lady Gaga, whom she saw in concert. “Her freak empowerment message made special sense for me,” Sydney said. “I figured if she can wear meat dresses, I can be a giraffe woman.” She therefore had a friend make customized rings, which he then soldered around her neck. 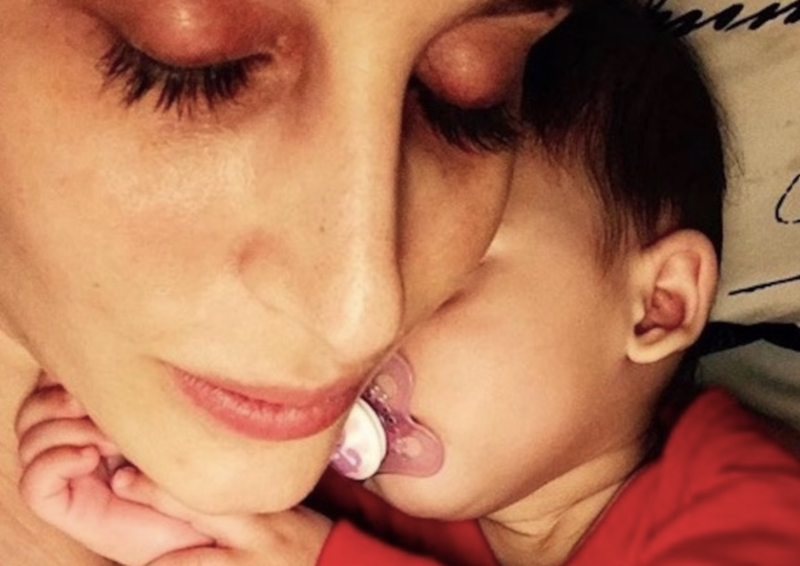 It wasn’t easy – as her skin was burned in the process – but it was done. She would be the giraffe woman she dreamed of being. It would prove to be a difficult transformation, however. 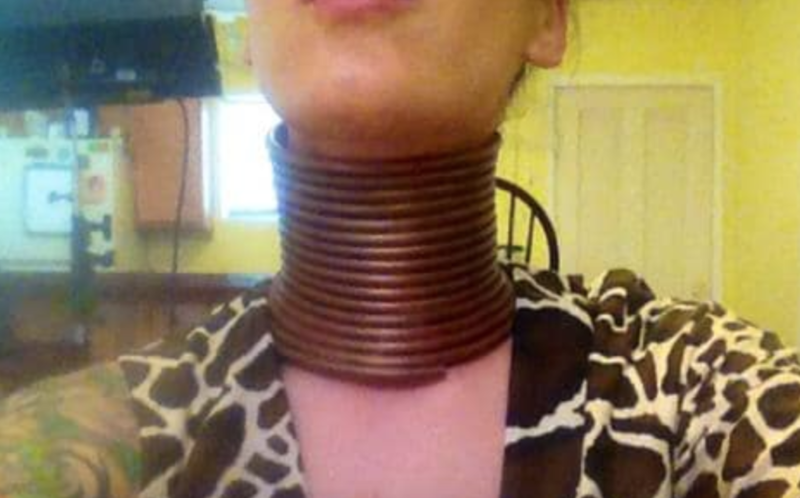 The obvious hardships of wearing the neck coils around Sydney’s neck had to do with her health. Firstly, it restricted her range of motion in a manner that made driving difficult, although she claimed her peripheral vision had improved. Another issue was social, as she said that during the hot summer months, if she isn’t somewhere air-conditioned her neck starts sweating and she starts to smell. 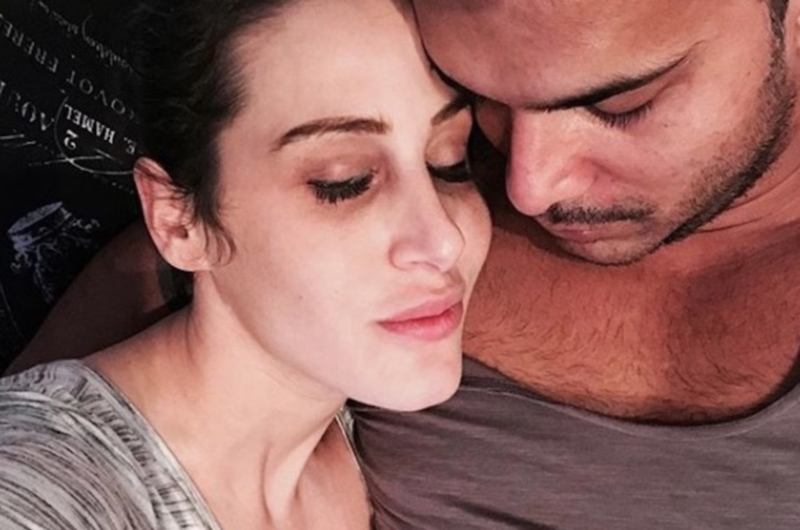 What impact did her body modification have on her romantic life? While her decision to wear the neck coils was done for her own benefit and no one else’s, Sydney found it difficult leading a normal life, and became introverted and isolated. “I tried to avoid the public,” she added. “People would come up to me while I was grocery shopping.” As for relationships, she discovered they became harder as well, as dates only wanted to talk about the rings, which got old fast. Even if a partner acted like they were okay with them, they’d still ask her to remove them around their family. But what about her health? Southern California orthopedic surgeon Dr. Jonathan Nissanoff said extending her neck in such a way was potentially dangerous, as it could injure nerves in the neck. 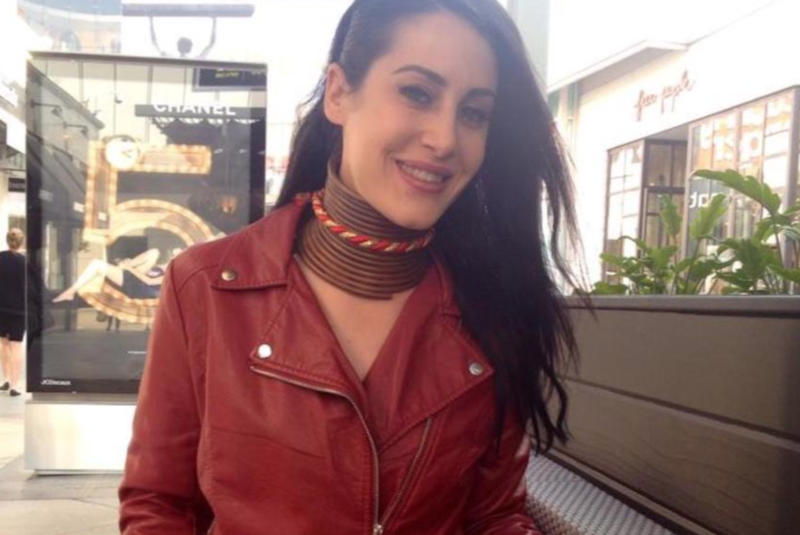 While the women of the Kayan Lahwi begin wearing their rings when they are five, Sydney began when she was already an adult and had finished growing. All she was doing, then, was stretching her skin or putting her bones into traction by pulling them apart, he explained. Her bones were never made longer – she was merely pulling down on her collarbone and rib cage. Despite the health risks, it could not be said that Sydney Smith never profited from her decision to wear the rings. For one, she was featured on Ripley’s Believe It Or Not! 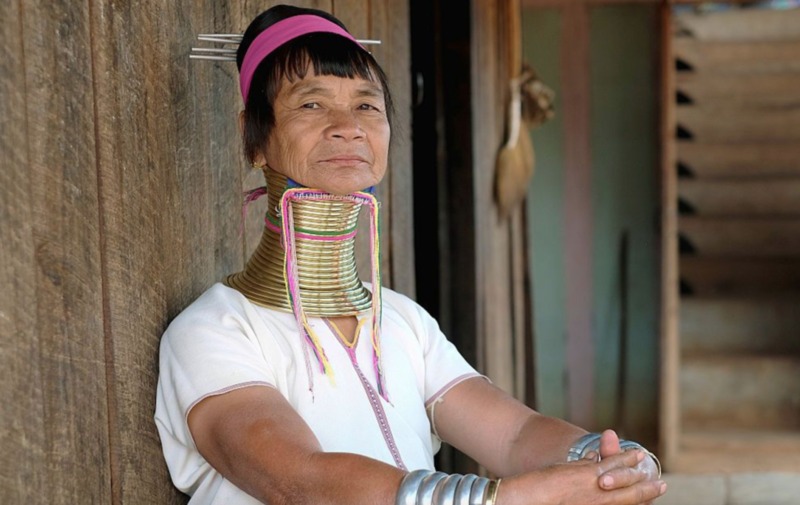 Interestingly enough, her original inspiration for the transformation – the long-necked women of the Kayan Lahwi tribe – have been a Ripley’s mainstay since 1923. Ripley’s vice president of exhibits and archives added their crew once filmed one of them taking her rings off. While it didn’t kill her, her neck was severely scarred and even had mold growing on it! Ripley’s wasn’t the only one to come knocking, however. In short order, modeling offers started pouring in, and Sydney found herself fielding proposals to appear as a model in various capacities. One of those offers came from Penthouse magazine – and she agreed to pose for a spread that had a distinctive circus theme to it along with several other “sideshow attraction” women. 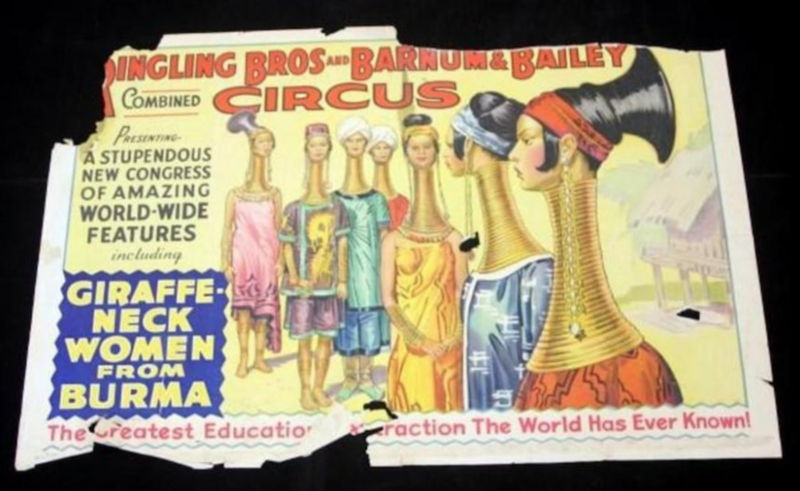 It was, sadly, far from the first time women with neck rings were considered sideshow oddities. Sydney’s inspiration in taking up the rings, in fact, blazed a trail in that regard. The various Ripley’s Believe It Or Not! 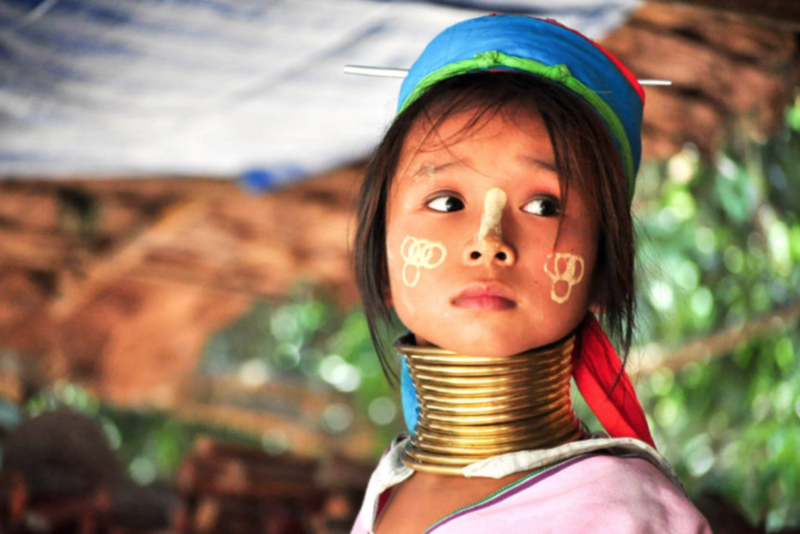 Attractions throughout the United States still use images and displays of women from the Kayan Lahwi tribe to illustrate the different strange aspects of foreign cultures. Going a little further back, however, shows us the tribe’s women were once used as literal attractions, with circuses in the late 19th and early 20th century kidnapping them from their homelands and bringing them to Europe and the U.S. to serve as public displays. Even famous outfits such as Ringling Bros. and Barnum and Bailey Circus participated in the practice. While the practice of forcibly making people participate as attractions in a circus has thankfully passed from the world, modern-day shows still use humans – especially those who favor body modification – as willing performers. Take Katzen the Tiger Lady, for instance, who works with a sideshow down in Texas. Katzen – the German word for “cats” – takes after her namesake, and had tiger-like stripes tattooed over her entire body. She even had whiskers inserted into her face via piercings. Think that’s extreme? Her ex-husband, who goes by The Enigma, has horn-like implants, multiple body piercings, and a full-body jigsaw-puzzle tattoo. 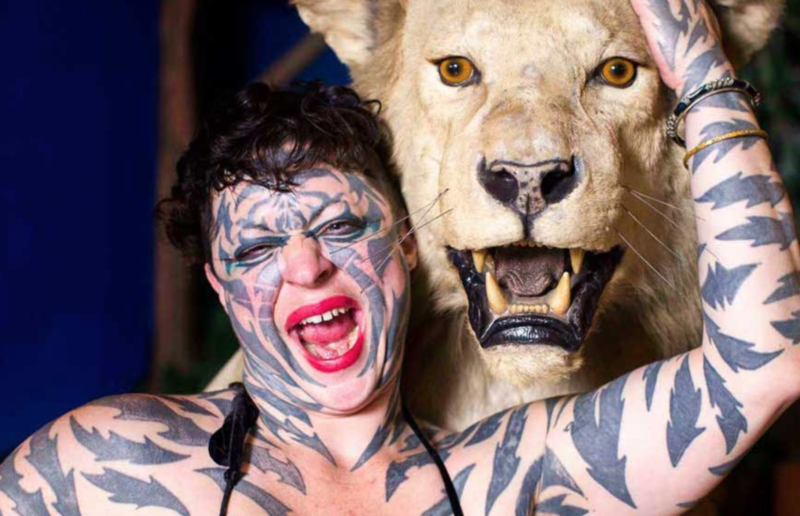 Body modification isn’t exclusive merely to circus performers, however, as one Swiss woman is alleged to have undergone multiple operations to give her a cat-like appearance – to please her then husband! 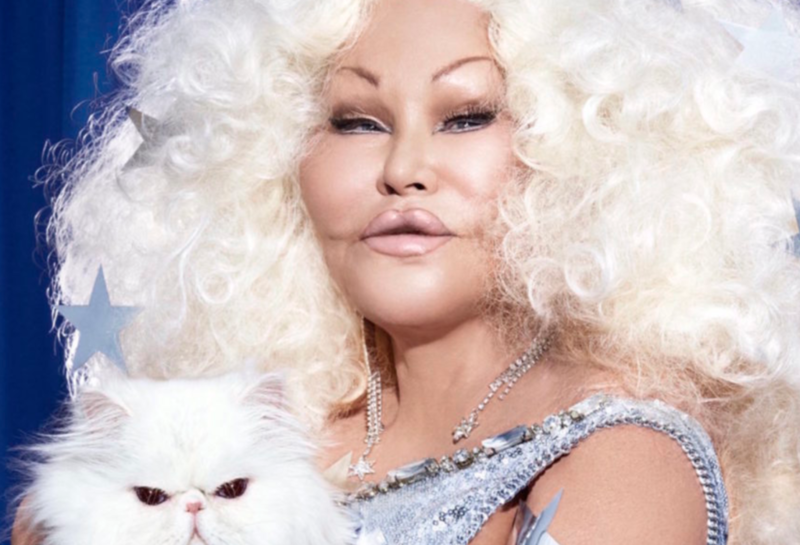 Jocelyn Wildenstein, a socialite known as the Catwoman, strongly denies the allegations, and claims she had never had any work done, crediting her unique look to her Swiss genes. Wildenstein said her ex-husband started the rumors simply to smear her. Whichever was the case, she certainly looked unusual. As for Sydney, her body modification – despite being less severe – began taking a toll. For five long years, Sydney added more and more rings. While the tribal women who inspired her get up to about 20 or 25 rings, Sydney made it as far as 15 rings, which weighed five pounds. Nevertheless, they made her feel extremely isolated from the rest of humanity, with the rings taking over her life. “It was always about the rings,” she protested, “it wasn’t about Sydney anymore. I couldn’t function properly.” For six months, she deliberated whether to have them removed or not. Finally, she’d made up her mind. In fact, she broke down and decided to have them removed several times, but would back out at the last moment each time because of what she called “anxiety” felt because the rings now felt like an “integral part” of her. It would take some time, but she finally resolved to have them removed, and mustered the courage to go through with it. How would she go about it? Would it hurt? And, more than anything else, what long-term effects would it have on her neck? Sydney needed a friend’s help to remove the rings, and said the process was “arduous,” since a very strong type of glue held them together. The first order of business was therefore to apply a chemical to them to eat through the glue. After it did its job, the rings could then be cut through and be taken off. It was very painful, she recounted, and lasted about 15 minutes. When it was over, however, she was finally freed of their weight – both physical and figurative. Five years later, what did her neck look like? With the rings finally off her neck, she could see it again, for the first time in half a decade. It was not a pretty sight – it was covered in dark bruises, and initially felt very weak, “kind of like arms on a toothpick.” The bruising eventually went down, but Sydney still had to do some neck exercises with her chiropractor to improve her neck’s condition. She also did physical therapy several times a week to ease stiffness caused by the rings’ weight. Was it truly worth it? Despite the pain and necessary rehabilitation, Sydney said she didn’t regret her body modification. “I really enjoyed the feeling of them around my neck,” she mused, adding she even missed their weight on her collarbones, which – she said – was “weirdly very comforting.” She also truly believed they made her neck longer, claiming she got it up to nine or ten inches. Nevertheless, she was adamant in her decision, as it made her miss even the most rudimentary things she used to be able to do, like running and hiking. What was next for her now? After years of struggling with relationships that went nowhere because all men could focus on were the rings around her neck, Sydney was also freed to pursue a serious relationship – for the first time in five years – not as the “giraffe woman” but merely as Sydney Smith. And, as it turned out, she was very successful in her renewed efforts! Sydney had found a partner, and she could finally tell with absolute certainty that he liked her for her – not for the rings, or the attendant fame. Not long thereafter, her life was changed forever. 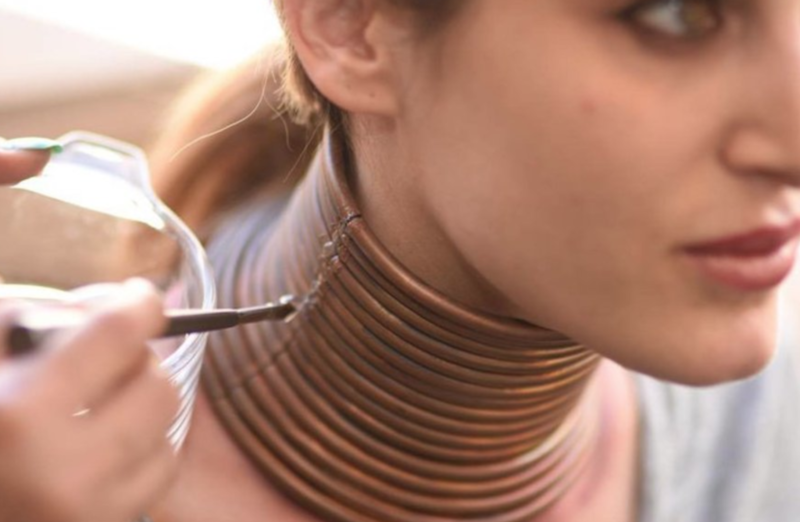 ‘People have this misconception that they think that your neck is going to look super long when you remove the rings,’ she said. ‘It goes back to normal. I do feel my neck is longer than when I started but I feel like it has shrunk since I took them off.